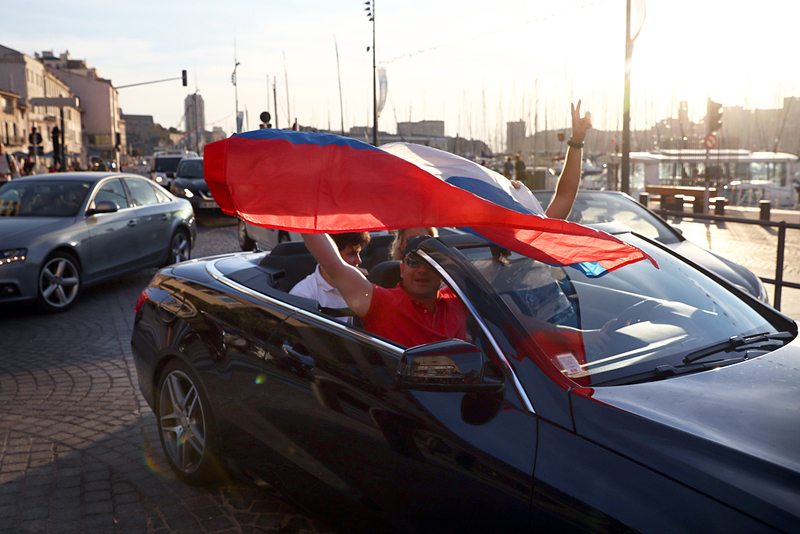 MARSEILLE, FRANCE - JUNE 09: Russian football fans hold a flag as they drive in Marseille ahead of the England v Russia game on Saturday, on June 9, 2016 in Marseille, France. Football fans from around Europe have descended on France for the UEFA Euro 2016 football tournament. Russian football fans hold a flag as they drive in Marseille ahead of the England vs Russia game on Saturday, on June 9, 2016. Football fans from around Europe have descended on France for the UEFA Euro 2016 football tournament.